Unless you’ve been living under a rock for the last week you’ll have heard all about Pokemon Go – the augmented reality update to one of the most popular video games of the last 20 years. 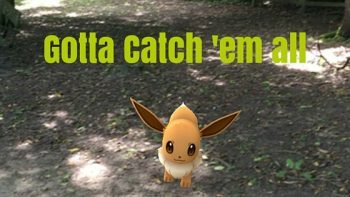 And what’s more, you’ll find Pokemon Go in Appley Park, Ryde – our tree climbing location. The biggest craze to sweep the world since the last one, Pokemon Go gets you out and about to hunt down Pokemon in your local area. If you don’t have the app, it’s a great way to get out and about – yes even the kids will want to go for a walk if there’s a chance of adding to their Pokemon collection. Eevee found in Appley Park! The folks over at Yoppul have been doing some game research that shows, perhaps unsurprisingly, that Ryde and Newport are the most active places on the Island. And we happen to know for a fact that there are some Pokemon in Appley Park, Ryde – what better excuse do you need to get out and about! We’re loving the fact that the game is getting people out and about to enjoy the Island – just don’t forget to look at the scenery behind your Pokemon! Rumour has it there are a couple of Pokestops in Appley Park, not a million miles away from our tree, and there’s also two Pokemon Gyms on the beach. For the uninitiated these are key game spots where Pokemon gather and players can battle each other for the honour of catching them. If you’re climbing with us, you’ll definitely be able to add to your Pokemon collection on your way to the tree, and if you’re not come say hello and show us how many you have caught – we want to know where they are! If you haven’t yet downloaded Pokemon Go, it’s available on Apple and Android and is free to play. There are in game purchases if you want to get really far in the game, but for the fun part of wandering around finding Pokemon, it’s free all the way.